Release date 6th February 2012. 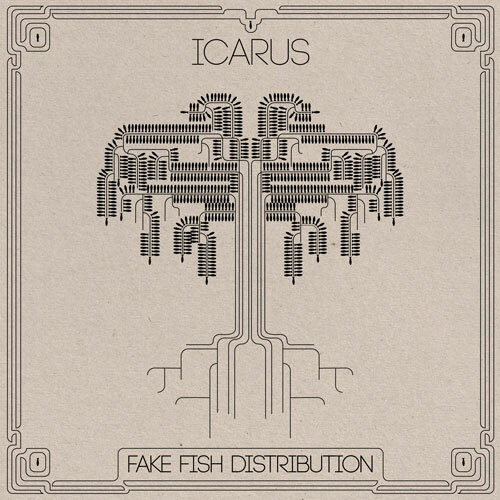 Icarus’ forthcoming album, Fake Fish Distribution (FFD), their 9th in all, uses generative and parametric techniques to create a musical work that draws on the increasingly fruitful relationship between contemporary electronic music, algorithmic software processes and designed variation. “From where I stand today, I donʼt see many who challenge our expectations of the role of the electronic music composer in the way Icarus do”. – Scott McMillan, The Liminal. "Ultimately, this album may rely a lot on computer input, and may sound, at times, like an extremely complex machine, yet Ollie Bown and Sam Britton have perhaps created here their warmest and most human record to date." – The Milk Factory. "Aside from being a fascinating exercise in digital merchandising, Fake Fish Distribution is also a musical joy to behold. A cavaclade of IDM/electronic ambient treasures – FFD is for anyone with an open mind and an ear for sonic perfection." – God Is In The TV Zine. "FFD is enjoyable as a purely intellectual experience and as a remarkable statement on how art and technology as well as new paradigms of music distribution join up to create new innovative products" – The405. "Although conceptually forward-thinking and original, importantly the music is of similar standard and will prove to be an interesting listen for fans of electronic music released on labels like Warp. The album also casts light on wider subjects like music ownership and digital formats and to an extent it also promotes discussion over the role and nature of writing about music – each listener will have their own personal listening experience that maybe requires reviews to be approached in a different, more flexible way." – Steven Johnson, MusicOMH. "Fake Fish Distribution is a lot of different things all at once. It’s a statement, an art piece, an avant-garde electronic record. It is random loops upon random loops. It is a chaotic record. Despite this, it’s actually pretty good – just don’t play it to your parents." – David Pottnegrine, Planet Notion. "You can get your own beautiful, Eno-inspired MP3 snowflake from Icarus’ website" – Joshua Kopstein, Motherboard. "one of the most conceptually interesting projects I’ve seen in awhile " – Hypebot. "Icarus have taken a trail-blazing approach for their new album" – Ableton blog. FFD was composed using normal electronic music production tools and uses the normal medium of music distribution — the media file download — but comes in the form of a vast array of structured variations on the album’s musical content, feeding unique versions to each unique listener. FFD reinvigorates our understanding of what it means to own a ‘copy’ of something, in an age where the contents of our music collections are not even distinct objects, but clones of the exact same bits that belong elsewhere to others. You give somebody your phone number, not a ‘copy’ of your phone number; how can you experience ownership of this stuff except in a logical, legal manner, that old fashioned sense of ownership, going beyond the rights associated with its use? The motivation behind FFD is to think of how copies of something can be regain that distinction that is grounded in an individualised relationship to an entity, a relationship that is lost in the age of network-distributed music. In 2011, the UK electronic group Icarus (Ollie Bown and Sam Britton) set out to return to studio production for the first time since their celebrated 2005 album I Tweet the Birdy Electric. In the interim the duo’s collaborative electronic music productions had focused increasingly on the possibilities of improvised electronic music performance, perfected through custom performance tools and documented in albums that were either live or edited reinterpretations of live improvisations. Since 2005, though, the world of making and selling records had changed so dramatically that Icarus did not feel at ease with the singularity of a traditional studio production. Generativity has been a strong theme in Icarus’ composition. In thinking of ideas for a new album, the question arose as to why, with so much ongoing experimental generative practice in both music and art, doesn’t generative composition have a foothold in everyday music listening experiences? That such works often run as software is one factor. This automatically introduces a level of obscurantism and is not in keeping with the relative universality of fixed media data files that dominate listener’s music collections. Besides that, the consistency of an album, and it’s longevity both as an artistic statement and as an anchor for memories and associations is a desirable property in the hands of its owner, even if not in the mind of its maker; We adapt to the repeated listening of a complex passage with heightened intensity more than with the waning of interest through familiarity. Except for the small niche of people fascinated by it, generative music wouldn’t appear to be on anyone’s wish-list. Reflecting on these ideas, Icarus settled on devising not a generative album but a parametric one, one in which the album was a fixed and finite entity, a decisive compositional work, but drawn out over 1,000 smoothly varying versions of the same body of musical content, a unique copy for anyone wishing to posses one, of which they can claim an exclusive ownership unfamiliar to the musical data strewn across iTunes and Spotify, but still thoroughly compatible with these worlds. After some months juggling software hacking and studio composition in continuous alternation, the result of this compositional experiment, FFD has been rendered in its entirety as 8,000 tracks — 1,000 variations on an 8-track album — ready to be released at the beginning of 2012 via a custom store that destroys each version as it is sold, handing the rights (and responsibilities) of the recorded work to its buyer. The music of FFD naturally reflects the process that created it, which is itself a natural progression of Icarus’ style, weaving chaos and chance into an awkward narrative of stuttering, stopping-starting spontaneity that all the while resembles ‘real’ music in its coherence and its engagement of the listener, who may perceive either that something has gone wrong in the strangest of ways, or that a door has been opened into an unfamiliar alternative future.